KayKiSpeaks.com: America could add on another state...Puerto Rico! A slim majority of Puerto Ricans want to join the United States of America, but it would take a voter referendum and approval from its Congress. The two-part referendum asked whether the island wanted to change its 114-year relationship with America, according to an Associated Press report. Nearly 54 percent (922,374 people) sought to change it while 46 percent (786,749 people) favored the current condition of the state, on Wednesday. The second question asked voters to choose from three options with statehood as the favorite, which garnered a 61 percent vote. President Barack Obama earlier expressed support for the referendum and pledged to respect the will of the people in the event of a clear majority, according to AP. It is unclear whether U.S. Congress will debate the referendum results or if Obama will consider the results to be a clear enough majority. The island is currently a U.S. territory whose inhabitants are U.S. citizens but are prohibited from voting in presidential elections. 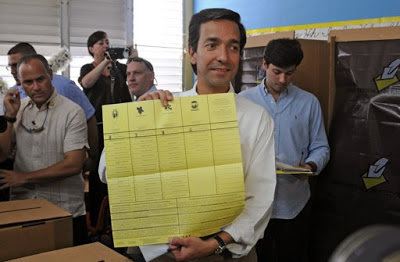 Its resident commissioner in the U.S. House also has limited voting powers. The future of the island's political status, however, also is dependent on who governs the island. According to partial election results, pro-statehood Gov. Luis Fortuno (shown in picture) was ousted by a razor thin margin by an opponent who supports the island's current political status. We'll keep you posted as PR moves along on its journey to possibly becoming the 51st state.